How to build the perfect hi-fi system | What Hi-Fi? "It’s no good having a band with the 10 best guitarists if I don’t have a pianist,” said former Real Madrid manager Manuel Pellegrini after losing his job. Each decision will have a knock-on effect: if you play all your music from your smartphone or tablet but still want a traditional hi-fi system, you’ll likely want something with Bluetooth built in. 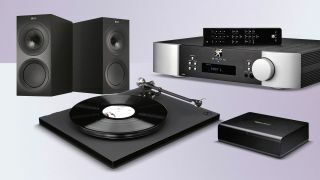 If you play mostly vinyl, you’ll need to think about whether you want a turntable or stereo amplifier with a phono stage or will buy the latter separately - a stand-alone phono stage will ensure greater versatility when upgrading in the future. And if you've taken on the task of digitising your entire music collection, maybe it's time to retire that CD player and invest in a well-featured music streamer instead? It’s probably worth making a check-list of the features you want - such as a headphone output, or Bluetooth - and then prioritising the things you need most and those you can do without. It'll help to stretch your money further. Having a realistic budget from the off will also help you spread your money more evenly. It should stop you buying your dream amplifier with the lion’s share only to match it with a budget turntable (the flaws of which it’ll emphasise), and exacerbating things further by playing through a pair of speakers you found by your neighbour’s bin. You might also have space restrictions. If you haven’t room for multiple components, you’ll need to consider if you can pool certain functions (such as a turntable with built-in phono stage, a ready-made system with amplifier and CD player combined, or active speakers) to reduce the number of boxes you have to accommodate. This needn’t affect the quality of your system, and it isn’t a decision that needs be made solely on space - but think carefully about which parts you’re most likely to upgrade when electing those you can combine. Stereo speakers react differently depending on their position in a room, and on how close they are to each other and to any walls - so the best-sounding pair you can afford when listening at a dealership might not be the best-sounding pair when you get them home. We always recommend measuring the dimensions of your room when it comes to choosing the right speakers. Don’t be blasé when it comes to positioning, either - they’re likely to come with a manual with the manufacturer’s suggestions for placement, but there’s nothing like experimenting with a keen ear. Of course, you may not be building your system from scratch. Perhaps you already have one or more elements and are now looking to find the final pieces of the jigsaw. We often make the point that you shouldn’t dismiss a product simply on its star-rating in our magazine, but this is a particularly pertinent point if you’re looking to add to something you already own. Certain products may not be flawless all-rounders, but they could well have the blend of talents you’re looking for. So often in life it’s the little things that can have the biggest influence, and that’s the case with system building. Set aside funds for quality cables, speaker stands and equipment supports – you simply won’t get your money’s-worth of sound if you don't. And the golden rule, as always, is: never buy anything without having heard it first. So there you have it. A few tips and tricks to achieving the system of your dreams. To help you on your way and hopefully provide a few sparks of inspiration, we've put together a few systems over the years that we know work together. We've covered various bases here: using different sources and system components, setting various budgets, selecting the best products of their time, and reflecting changing listening habits - along with including some helpful alternatives. Have a look to see what tickles your fancy, and start brainstorming your dream hi-fi system. We'll be adding more systems to this list as and when we've tested them.